Here's a really easy and delicious dessert to bring along to your Memorial Day BBQ! Who doesn't LOVE s'mores? These pretzel s'mores take the American snack to a whole other level... pretzels dipped in chocolate add a salty/sweet combination that trumps the graham cracker. - Heat chocolate chips in microwave until melted and smooth, stirring every 30 seconds. - Cover cookie sheet with parchment or wax paper. - Lay out 20 pretzels on prepared cookie sheet. - Place one half marshmallow and 1 piece (tiny rectangle) of Hershey bar on top of pretzels. - Taking sandwiched pretzel s'mores one at a time, dip in melted chocolate half way up the "mini S'mores sandwich"
How do the marshmallows melt? 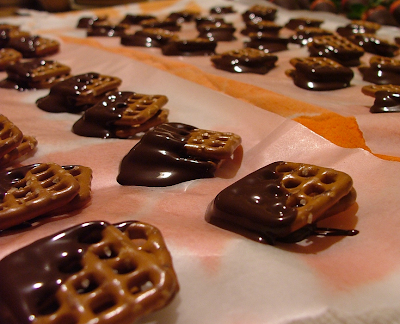 do you put the pretzel sandwiches in the microwave or oven before dipping in chocolate? Or are the marshmallows raw?